American Crafts Shoreline reminds me of days of summer. Relaxing in the sand, watching the sun set. With this card I was trying to get the feel of resting on the water in the middle of the ocean, with the sun high in the sky. 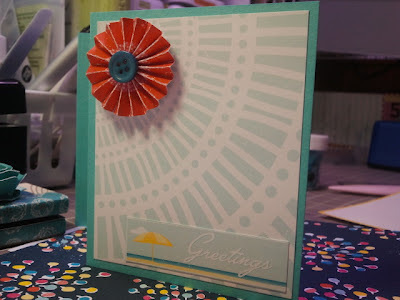 Using Scrap Happy cardstock as my base and AC Shoreline as my background. 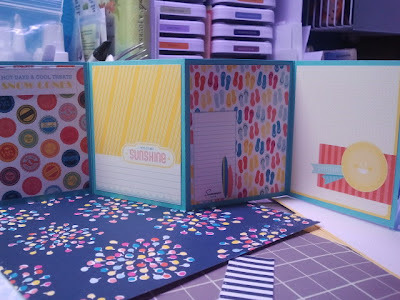 I used the DIY Thickers and turquoise embossing powder from AC. 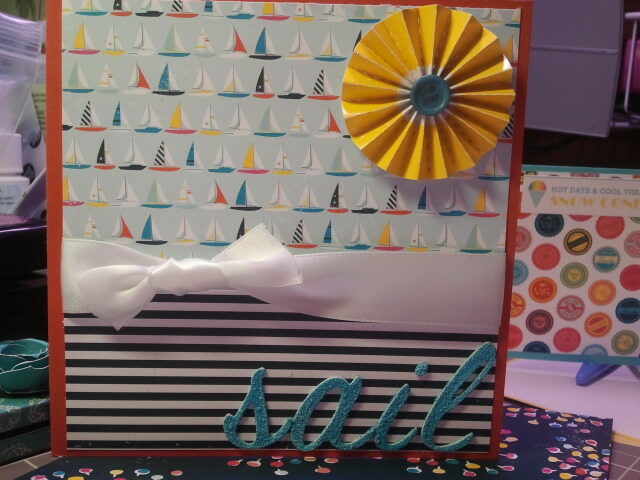 All products used in making this card can be found at Scrap Happy Ohio, online and in the store. Make sure to stop by and check out all the new items from CHA too. After making my card I was still wanting to play around with this adorable paper. So I grabbed another piece of Scrap Happy cardstock and started playing. This is just a little brag book made with cardstock and pieces of the 6 x 6 stack of Shoreline. Wow Mindy so ambitious. Three projects and they are all wonderful. These papers are so much fun and you have done beautiful work with them.